As one of the most popular folk handicrafts, Dai brocade features distinctive local and ethnic characteristics. 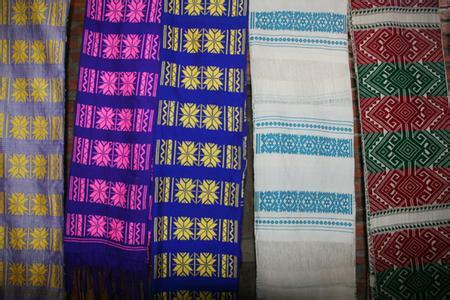 The technique, well-known for its rich colors and exquisite patterns, has been passed on from mothers to daughters of Dai ethnic group for hundreds of years. With a thin rope, the Dai women tie the pattern on a sketch and make the brocade with their hands and feet. Producing a piece of Dai brocade demands several hundreds even a thousand thin ropes which are tied to the sketch. A tiny mistake of any rope would result in the failure of the whole brocade. Dai brocade boasts of rich colors, exquisite patterns and lasting sturdiness. The patterns of brocade cover rare animals and flowers, with each color or pattern conveying specific meaning. For example, red and green honor ancestors. The pattern of peacock symbolizes good luck while elephant stands for good harvest. The implied meanings of the colorful patterns vividly demonstrate the Dai’s wisdom and their pursuit for a happier life. Nowadays, based on the time-honored tradition, Dai brocade enjoys rapid development. Besides being used for sarongs, bags and bed sheet, it is also used for such new products as screens and sofa cushions. With bright colors and exquisite patterns, the brocade gain great popularity among people home and abroad.